Dolphin Beach Dive Site in Nanoose Bay is a great scuba diving location for all levels of divers. From the newly certified to a well seasoned advanced level diver, you will find this a very interesting dive location. A quick note about this dive site is that you need a minimum of a 10 foot tide (higher is even better) to make for an easier entrance. It is a rocky beach so watch your step! I am not trying to dissuade you, in all honesty, it is a great dive site! The site is located just one half hour north of Nanaimo, BC. Just follow Hwy 19 north to Northwest Bay Road and then follow this winding road for a few kilometers and turn right at Stewart Road. Stay on this road and it will naturally turn into Dolphin Drive. Continue on and watch for Blueback Drive on your left (water side) and turn here. Follow Blueback Dr. and after a sharp right turn and down a little dip, Dolphin Beach is on your left. Just look for the rocky beach and park on either side. If you get to the site and the wind is really blowing or the tide is to low for a decent entry, another minute down the road is Tyee Cove Dive Site. Depending on the time of year, (late spring, summer, and early fall) there can be some kelp to swim through at this location. With a little current the kelp is beautiful, but it will try to grab you, so pick your way through carefully. If you need to be reminded, always carry a knife! Away from the beach at zero degrees and continue on this course. You will gradually work your way deeper as you swim along some rolling terrain that resembles giant steps. About a 10 minute swim will get you to the top of a wall that drops off to a depth of 100 feet plus. This is where the open water divers stay, leaving the advanced divers to explore over and down the wall. Sea Urchins, as well as a nice variety of fish. 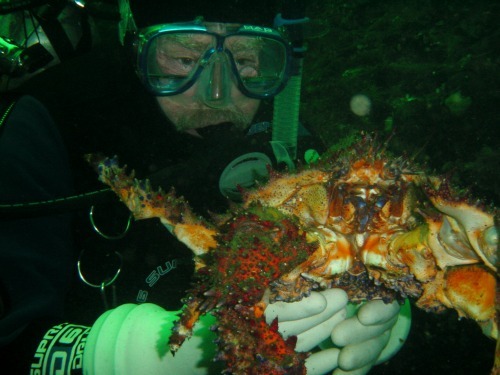 We have also on a few occasions come across fairly large Puget Sound King crabs here, not to mention both Octopus and Wolf eels. As you drop over the wall swim to your right and explore along the walls many cracks and fissures. In this direction seems to be best! When ready to turn back a heading of about 210 to 230 degrees will get you back. A cool variation to this dive is to pick a day with a large rapidly ebbing tide and then simply ride the mild current a few tenths of a km south to the dive site at Tyee Cove and exit there. We would suggest you stay around 50 to 60 feet in depth and just follow the natural contour. It's a short walk back to Dolphin or you can bring two vehicles!